In Red Rising (read my review), Darrow undergoes extensive surgery to pass as a Gold and so rise to a level of power where he can destroy the Society from within, and so avenge his wife’s death and bring freedom to his people, the Reds. 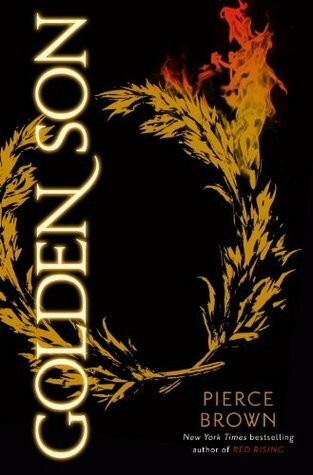 With Golden Son, Pierce Brown brings Darrow’s story forward, raising the stakes and ratcheting up the odds against his protagonist’s success, all while keeping the story going at a fast pace and adding nuance and definition to a diverse and interesting cast of characters. Darrow has triumphed at the Institute of Mars and under the patronage of Nero au Augustus–the ArchGovernor of the planet and the man who ordered the death of his wife Eo–he now attends the Academy. There he must prove himself in order to achieve what Augustus (and the Sons of Ares) want for him–control of a fleet of starships. What matters to Augustus is power. Darrow must deliver or be cast out of his patron’s service. The second book in the series stands more on its own two feet than the first. Golden Son is a stronger contribution to dystopian literature. Brown ramps up the suspense even more and sticks to the trilogy’s two big questions: Can an outsider, born a slave, rule the Society and will anyone accept him once they know the truth? We meet quite a few interesting new characters and see new depth those who return. Mustang, Sevro, Fitchner, Roque, the Jackal all have return, and the complications in their relationship to Darrow remain after the Institute. Brown also provides more details on the mysterious Sons of Ares and the role of the media in revolutions. Are the Sons terrorists? Freedom fighters? Something in-between? Brown also introduces new characters from different Colors. The cyberpunk-ish Blues that fly starships and do other space-based technological work, and we get up close to Obsidians who are gigantic, pale warriors who chant death songs before combat. With their Norse names and belief in Valhalla does that make them space Vikings? Is that a thing? I gave Red Rising five stars for Brown’s command of plot and characterization. What I liked about the first book is there in the second, even more so. I read the whole thing in one sitting, and there never was a dull moment. Golden Son is definitely a contender for science fiction book of the year. Brown never fails to entertain, to keep the plot going, twisting his characters’ fates, then reversing them. Much recommended if you read Red Rising and are ready for more where that came from.